@ptitty1231, sorry thats a negative. @ptitty1231, You ever tried a Bacon King? No salad, no ‘special sauce’, just 1,600 calories of beef, cheese, and bacon in a bun. This is one of those times where the phrase “Pick your battles” fits. Sometimes its best to just leave it be. Supermacs goes through the legal problems, and burger king gets the benefits. That doesnt seem fair. @prxjxct, publicity for being able to abuse one of their two main competitors. @ThePandaPool , the thing is though, the people who spent the most money on that case are McDonald's, and they're the ones who initiated the lawsuit in the first place. 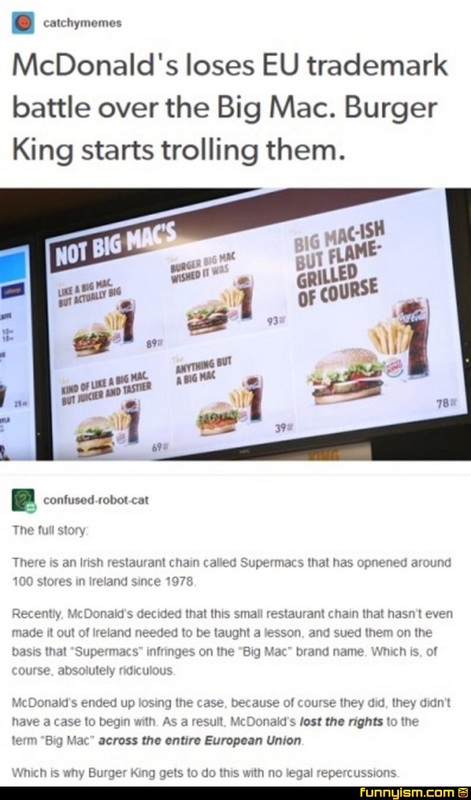 So, they lost money, gave themselves a bad reputation, made themselves look like fools, and inadvertantly gave positive PR to Supermacs, all while losing the rights to the name of their signature product. Really, what Burger King does here isn't really anything more than one company sassing another company over a stupid and entirely avoidable mistake. McDonald's calls it the royale over there cuz if the disputes. they have for a while.